The Donald Trump-era perspective is that climate change is essentially an exaggerated threat, that coal, oil and gas are tremendous, and that the Paris agreement is a bad deal for America and should be "cancelled". Given that almost all the small US delegation to Bonn were people who have previously been involved in climate discussions under the Obama administration, it must have been quite the mental u-turn to suddenly have to keep repeating the mantra in discussions here: "Our position is under review." However, President Trump may be a little distressed to hear that instead of a stony faced resistance to the warmist hordes in Bonn, the US team has actually been seen as playing quite a positive role. In fact, one of the areas of discussion that made the most progress in these talks was, shock horror, driven by the US. "What we have seen is a generally constructive team," said Yamide Dagnet from the World Resources Institute, an observer at these talks. "One of the US team was co-facilitator with China of the transparency discussion - this is one of the building blocks of the Paris agreement that made the most progress during this session. So we are quite pleased that there was still a constructive engagement." The skilled negotiators from 180-plus countries involved in these talks have been doing their best to send soothing signals to Washington that everyone would be better off if the US was to stay in the game. Fiji will become the first small island developing country to hold the presidency of the key annual meeting of negotiators, COP23, which will be held in November, again in Bonn. The woman who will lead the talks, Fijian climate ambassador Nazhat Shameem Khan, reached for an appropriate Pacific island metaphor when discussing continued US participation. "It's very important that all members of the family stay in the canoe and that we paddle in the same direction, and that nobody jumps out," she told BBC News, without specifying the creek up which the aforementioned canoe would be travelling. "But if they don't (stay) what are our options? The answer is we carry on with the work programme and we do it with or without members of the family who have decided to bail out." Another perhaps less subtle signal has been sent by the European Union. It is convening a ministerial meeting next week for the first time with representatives of China and Canada to discuss climate issues. The inference in this is that Asia, Europe and the Americas are prepared to move ahead on climate without the US. Some observers in Bonn welcomed the move. "This is our hour of need, when we need to see other countries stepping up to ensure that the world remains on course," said Mohammed Adow from Christian Aid. "What we've heard is a clear, strong message from Europe that it is going to help cultivate the diplomatic leadership that is required to keep the world on course. "Climate change won't wait until we have a better leader in the White House or until the White House gets serious about its commitments because we know the world is warming." 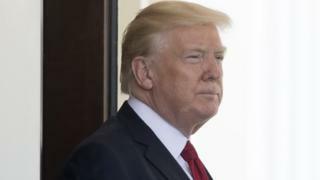 However, others were somewhat worried that overtly trying to force the issue might be the wrong approach, given the temperamental nature of the current US president. "I think pressure may well be the wrong tactic right now," said Elliot Diringer, a Clinton-era White House press spokesman and a former member of US delegations to the UN climate talks. "Decision-making in this White House is highly unpredictable and the president can react defensively when pushed against the wall. "I think the better approach is to encourage the US to stay in and be as ambitious as it can be." A decision on future US participation is likely after next week's G7 summit in Taormina, Sicily.